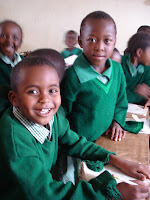 Wild & Precious: Help me give children education in Kenya. Help me give children education in Kenya. I want to share something really cool I'm doing to help in Africa, and I want you to check it out too. I'm doing that whole run-a-race thing to raise money. It is with Ellie's Run for Africa, the inspiration of an 11-year-old girl, and is a 5K run that will be held in Nashville on June 14th. Over the past year I have heard so much about Kibera, Kenya. To start off, my good friend from college headed there with SIM in the fall and has been involved with education and women’s ministries. Only a few months after Katie’s arrival, the riots broke out and her mobility as a missionary was really stifled. This is when I found out that my cousin was headed over there as a photographer. She has since chosen to live there. Kibera is the largest slum in East Africa, where 800,000 people live in an area just over one square mile. Not surprisingly, one of the major problems there is lack of formal education. The public school system requires that children there have a uniform and their own schoolbooks in order to go to school. Unfortunately, since most families in Kibera, Kenya, live on less than $1 a day, most parents can’t afford to buy these basic necessities. That’s where Ellie’s Run and you come in! I’m asking my friends and family to take on one child each. That’s it. Put a child in school for a year for $25. It will buy them the eight schoolbooks, two uniforms, and pair of shoes they need. Pretty awesome to think that just giving up one lunch after church on Sunday will educate a child halfway across the world for an entire year, huh? These donations are made through a non-profit organization based in Franklin, TN, called African Leadership (www.africanleadership.org) that trains local African pastors and church leaders and funds relief and development projects in their communities, like the Calvary Christian School. Ellie’s Run, in its short three year history, has helped raise the awareness of and funding for these children – more than $100,000 to be exact. To date, funds from Ellie's Run have been used to help build four classrooms and pay rent at the Calvary school, as well as pay for their continued support of 400 children’s uniforms, shoes, and school books. In 2007, by tripling raised funds, Ellie’s Run continued supporting the Calvary School, as well as helping to build classrooms and science laboratories at a new partnering school, New Dawn. This annual race allows those projects to continue. All this from an 11-year-old! P.S. Also, if you don't mind shooting me an email back at kblair.s.mcleod@gmail.com so I can keep up with my progress, that would be great!